Publicly funded memory institutions continue to be asked to demonstrate their economic value, and to increase efficiency with public resources. In her bibliography of international library impact studies, Roswitha Poll (Poll, 2016) lists 49 studies focused on the financial value of libraries. In spring 2013, the Toronto Public Library Board and City Council made a motion that the City Librarian undertake a study to understand the economic impact of library services, the incremental value of library open hours, and the role the library plays in economic development. In response, the Toronto Public Library engaged the Martin Prosperity Institute at the University of Toronto to conduct this study during the summer and autumn of 2013. The study was released in December 2013. This landmark study was the first of its kind in Canada, since at that time no Canadian public library studies were available to guide the research or to provide data for comparison. However, comparable economic impact studies, both in the public library sector in other countries and in other sectors, were reviewed in depth. Studies reviewed included economic impact studies by several public library systems in the United States, including Santa Clara, California (Berk and Associates, 2013), Philadelphia, Pennsylvania (Fels Research & Consulting, 2010), Florida (Haas Center for Business Research and Economic Development, 2010), and Texas (Texas State Library and Archives Commission, 2012), and library systems in Australia (State Library of Victoria, 2011). To date, in Canada, 15 public libraries – both smaller and larger systems – have conducted economic impact studies applying the model used by the Toronto Public Library study. Economic evaluations compare costs and benefits. A common approach to economic evaluation is cost-benefit analysis (CBA), which shows whether the social benefits of an activity exceed its social costs; the costs and the resulting benefits to society are monetized to determine whether there is a net social benefit (NSB) (McDavid, Hawthorn, & Huse, 2013). The CBA approach is used extensively in North America to determine “value-for-money” and “return on investment (ROI) in public expenditures in many public sectors, including education, healthcare, and recently, libraries. Institution budgets provide the “direct spending” data, expressed in dollars. System data such as circulation, holdings, program attendance, technology use, and so on provide the “direct benefit” activities, expressed in number counts. A monetary value is assigned to the direct benefit activity data to calculate the dollar value that the activities contribute to the local economy. Indirect benefits are the result of the multiplier effect on direct spending: a dollar paid to a contractor for a branch renovation is re-spent in the community, and so on. The single dollar creates additional benefits across the community. Multipliers are used to estimate the actual dollar amount based on spending. Together, these three elements provide an estimate of the total impact on the economy. A common evaluation question is whether or not the activities being examined produced or caused the observed and intended outcomes. It is difficult to prove a cause and effect relationship between any given activity and the outcome because there are many other activities and conditions at play within the same time and space. While evaluators are reluctant to prove causality, the evaluation process is able to confidently demonstrate that the activities contribute to, or correlate with, the observed outcomes (McDavid et al., 2013). Measuring the value of library programs and services in economic terms only tells part of the story. Libraries make a positive impact on communities by inspiring through discovery, collaboration and creation: supporting intellectual freedom, ensuring accessibility, promoting literacy and lifelong learning, ensuring inclusivity, providing exceptional public service, and prioritizing transparency, accountability and fiscal responsibility in decision-making. 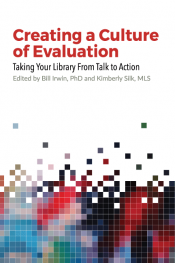 The next frontier in evaluating library value is to establish a common narrative, supported by data and evidence, to describe the social value of public libraries. Social impact studies use qualitative approaches to demonstrate the role they play a role in making a positive impact on society. Qualitative instruments such as interviews, case studies, surveys with open-ended questions and focus groups produce text-based data which is then coded according to themes or categories determined by the text content. Once themes or categories are identified, responses can be measured quantitatively; for instance, a percentage of responses indicate a certain condition. Using both quantitative and qualitative approaches to evaluate impact – known as mixed methods – is a standard practice among evaluators, since it builds multiple independent lines of evidence (McDavid et al., 2013). McDavid, J. C., Hawthorn, L. R. L., & Huse, I. (2013). Program Evaluation and Performance Measurement: An Introduction to Practice (2 edition). Los Angeles: Sage Publications.